Audi RS 5 | What Car? 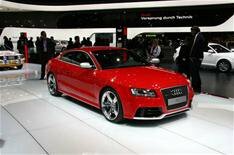 This is Audi's powerful RS 5, which was unveiled at the Geneva motor show today. Thirty years after it unveiled the original Quattro to a stunned Geneva motor show audience, Audis back in Switzerland with another powerful all-wheel-drive model. The RS 5, based on the handsome A5 coup, appropriately comes from Quattro GmbH, Audi's specialist tuning division. It will join UK roads in October and costs around 58,500. At its heart is a 444bhp version of Audi's race-derived 4.2-litre V8, linked to a seven-speed twin-clutch semi-auto gearbox. The V8 delivers its power at 8250rpm and pumps out 320lb ft of pull between 4000 and 6000rpm. The top speed has been electronically restricted to 155mph in line with a self-imposed limit set by German manufacturers. The seven-speed transmission allows full auto operation or comfort and dynamic manual shift programmes via steering wheel-mounted paddles. There's also launch control for full-power take-offs (0-62mph takes 4.6secs). Normally, the torque split between the front and back wheels is 40:60, but up to 70% can be transmitted to the front or 85% to the rear to ensure maximum traction. There's a new central differential to do this, plus a sport differential at the rear to disperse the torque from left to right. Torque vectoring the braking of individual wheels in extreme cornering also helps the RS 5 put its power down on the road. Variable damping comes as standard, but the Drive Select option also lets you vary the weight of the steering, auto gearshift points, the action of the sport diff and the engine mapping. The RS 5 comes with 19-inch wheels as standard, with 20s as an option.